When I was a young boy, I lived in a rural area in the northern US, very near the border with Canada. On rare occasions we would see a nighttime light show that we called the Northern Lights. Years later I was fortunate enough to experience this again—when I lived in rural Ireland. 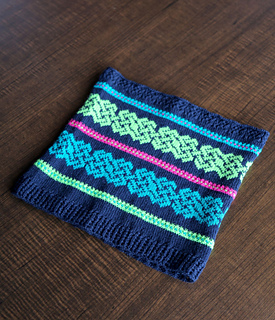 The contrasting colors used in this cowl are very close to those that can be seen when the Aurora Borealis illuminates the northern sky.